Growing up in the dangerous world of the Iron Seas, the mercenary captain of the airship Lady Corsair, Yasmeen, has learned to keep her heart hard as steel. Ruthless and cunning, her only loyalty is to her ship and her crew-until one man comes along and changes everything…Treasurehunter Archimedes Fox isn’t interested in the Lady Corsair-just the captain and the valuable da Vinci sketch she stole from him. When it attracts a dangerous amount of attention, Yasmeen and Archimedes journey to Horde-occupied Morocco- and straight into enemy hands. All romance books tell the story of how a couple meet and fall in love. Some couples are odd. Some couple are good. Some couples are creepy. And some couples are so perfectly matched they make you swoon each and every time they appear on the page together. Yasmeen and Archimedes are one such couple. 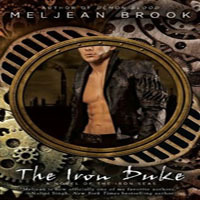 We meet both Yasmeen and Archimedes in The Iron Duke, the first book in Meljean Brook’s Iron Seas series. I liked them both immediately. Yasmeen is the Captain of the Lady Corsair airship and a no-nonsense woman. Yet she is fair in her dealings and with her crew. But don’t cross her as she is not afraid to gut you and hang you from the side of her ship *gulp* For some reason, Archimedes finds this to be very attractive. He loves how snarky Yasmeen is and wants her to be his. He is a charmer with a slight addiction to waistcoats, is very smooth and very cunning. He is also a bit of a celebrity thanks to his sister’s writing of his adventures as a treasure hunter. Both Yasmeen and Archimedes are likable, endearing characters and I was very excited to find out that book two, Heart of Steel, was to be their story. This is a Steampunk book but it is Steampunk done exceptionally well. I’ll say it: I have trouble reading some Steampunk titles. When the gadgets and doohickies take over the story, I’m gone. But in Meljean’s world, even though there are a lot of steampunk-ish details, they don’t overpower the story. The characters are the focus. I mentioned world. Anyone who writes Steampunk needs to have an incredible imagination – especially if the author wants her world to be different from the many other steampunk worlds out there right now. Meljean’s is amazing. The background stories for Archimedes and Yasmeen are incredible. You have no question when you are finished reading this book what events and people were responsible for making them who they are as adults. And the airships and the Horde machines and the towers and the mechanical limbs and, heck, even the zombies are described in a way that you can see them clearly. They simply provide the perfect backdrop for this series and for this book. Meljean writes wonderful supporting characters in this book. Characters from the previous book are mentioned but you don’t see any. Instead you are introduced to some new supporting characters that play very well with Yasmeen and Archimedes. And the story flowed very well in Heart of Steel. Funny moments followed by heart thumping action moments followed by tender moment and over again. A great read from beginning to end. Heart of Steel’s story is great. Full of action, adventure and charming humor. I am not even going to try to explain the story to you – there is just too much that goes on. Besides, I want you all to be surprised by the many turns of events like I was. But I will tell you that the ‘prologue’ done in letters between Archimedes and his sister Zenobia was so much fun to read. I found it was a really great way to start the book. I feel as though you could read Heart of Steel on its own, but you receive a much more detailed look at the world and learn why the characters are in the situation that they are in in first book. I believe your reading experience would be more fulfilling if you read the series in order. Besides, The Iron Duke is a very good book so you wouldn’t be wasting your time if you read it first. Heart of Steel is going on my keeper shelf. If you are a fan of Steampunk books, you must give this series a try. 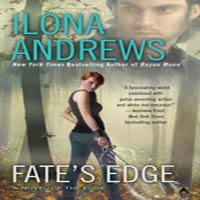 Even if it’s not your favorite genre but you like paranormal romance books, you should try it. The characters will draw you in and make you fall in love with them as you watch them fall in love with each other. 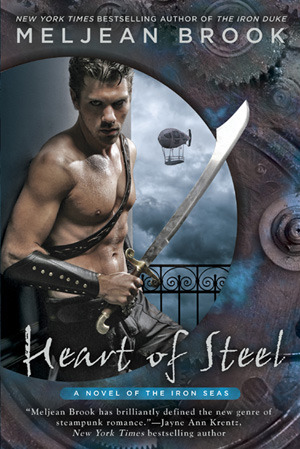 Share the post "Review: Heart of Steel by Meljean Brook (Iron Seas #2)"
this book sounds so intriguing. I didn’t know about it at all so thank you for the discovery. As I told you I don’t have read a real steampunk book yet, but I’ve one in my TBR pile, we’ll see… I really need to get the first one of this series, I want to lean more about these awesome characters ! Great review, I am glad you love it so much, but I really could not get into the first book. DNF for me. Yay! I’m so happy to see you loved this one so much. I’m dying to read it, as I adored THE IRON DUKE. Paranormal Haven – The quotes! So many. I just love these guys! Chelsea – You are going to LOVE it! Yay! I’m excited about this one, I loved the Iron Duke (read it, the audio just came out yesterday) I just finished listening to a novella from this series “Here There Be Monsters” and the narrator was fabulous! I think she’s going to be reading this one too, looking forward to it.